Afghanistan is a country blessed like few others in its mineral wealth. By some estimates the untapped gemstone deposits in this country are estimated to be $300 billion USD. However, the geological surveying of the country has been less than 10% of the area! Precious minerals, oil and gas have been estimated to be in the 1 trillion to 3 trillion ranges. It’s no wonder why Afghanistan is quickly moving to try to mine and develop so many of these resources. The fact that so many of the deposits are not mined will help Afghanistan to pull itself out of poverty. The revenue from the Ministry of Mines is estimated to be 1/3 of all Afghanistan government revenue by 2016. I have been on the ground in Kabul since July of 2011 teaching faceting, gemology, assisting with jewelry design and production. I have seen thousands of stones and loved almost every minute of it. I am a kid in a giant gemstone store! Most of the questions I have received from people concentrate on what kind of gems are in Afghanistan, so this article will discuss what stones are commonly found in Afghanistan. Afghanistan has almost every type of gemstone in the country. Diamonds have not been discovered yet, however if they are to be discovered it will be in Badakshan or Panjshir due to the geology of those areas. This information comes from the Ministry of Mines engineers who have surveyed the country looking for mineral deposits! 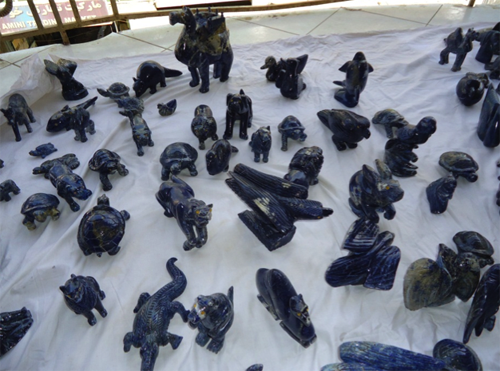 Medium and high quality lapis is often faceted or cut into cabochons. 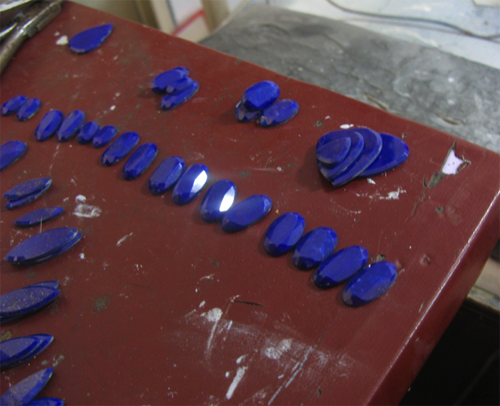 The picture below is from one of my student’s workshops where he specializes in lapis. 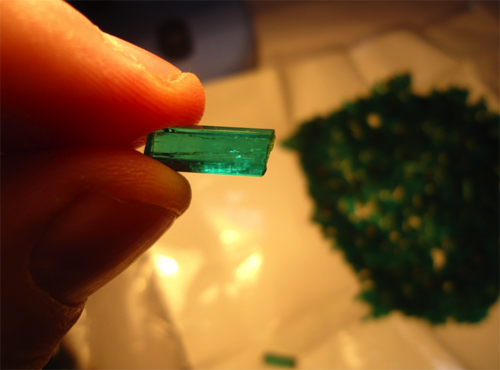 Afghanistan is also known for its emeralds. Panjsher is the most famous emerald deposit in Afghanistan and is well known for the quality of emeralds it produces. The emeralds I have seen have great color. The stones are often heavily fractured due to the mining process in the area. Most artisanal miners in the area use heavy explosives or old Russian ordinance to blast areas of emerald bearing rock. As you might guess, explosions and soft stones do not mix well! This is the number one problem with mining in Afghanistan and the ministry is trying to address these problems quickly. Crystal sizes can be quite large; with the largest crystal I have seen being 80 carats, which is pictured below. The stone was large but had some major inclusions. 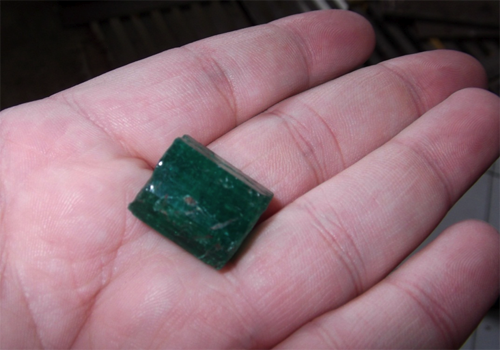 A high quality emerald crystal which was a part of a $60,000 emerald parcel. Ruby from Jegdalek has some of the best color I have seen in ruby. 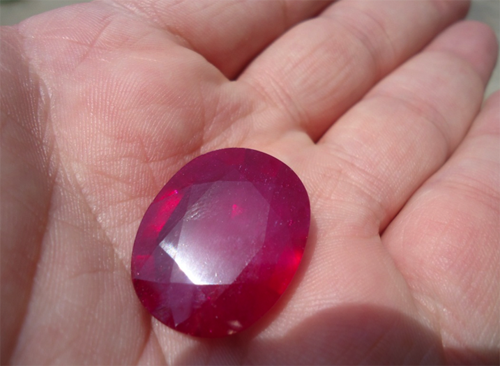 It may not be the quality of Burma but I would put it ahead of African ruby as well. The stones often have black inclusions and other inclusions that reduce their clarity considerably. Many lead glass filled gems and synthetic rubies are in the bazaars in Kabul as well. Not even the gemstone dealers themselves know about these treatments so my training has also focused on showing them how to identify treatments. 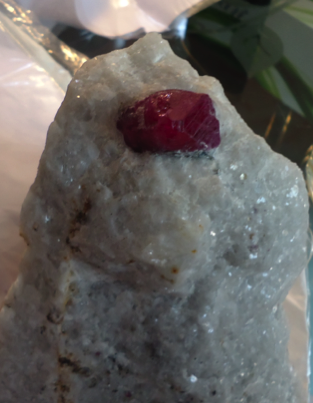 One gentleman I know wanted to sell me “an awesome” 35 carat ruby for $250,000. I quickly showed him how it was lead glass filled and asked how much he paid for the gem. He did not believe me and an argument quickly ensued. This was the only time my security has escorted someone out of the training center due to security concerns! A picture of the stone is below. Tourmaline is the one gemstone I wish I saw more of in Afghanistan. When I do see the stones they are often heavily fractured due to the mining process that uses explosives. I have seen some decent specimens but they are few and far between! Stones up to 100 carats are not uncommon. 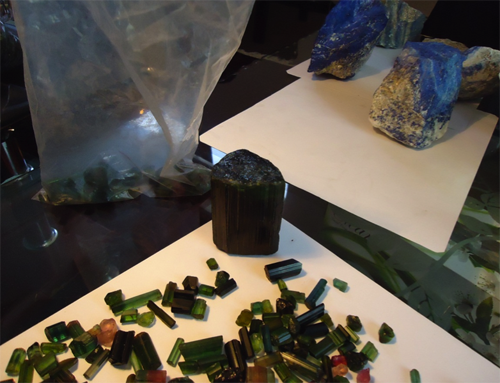 Tourmaline typically comes from Nuristan and Kunar provinces but can be found in many areas in the country. The most sought after colors by merchants and customers here are: mint green, blue, dark pink and bi-color. Aquamarine from Afghanistan is often very pale in color. However, the crystals are large and the clarity can be quite good. Sizes of rough gemstones can be 150 carats or more. Dark blue stones command a premium in the local market and often will approach the retail price in the United States. 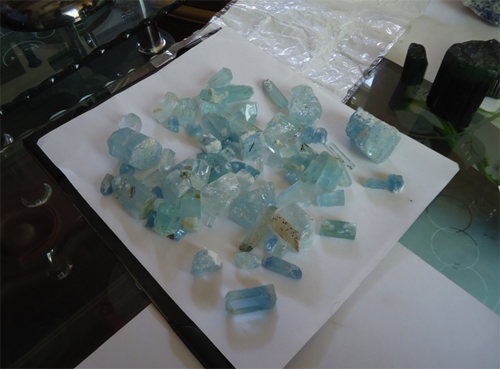 Examples of aquamarine crystals are below. Kunzite and hiddenite are also two very common gemstones in Afghanistan. However the colors are often pale and the crystals heavily included. While dark colored examples exist they are not common in the area. Clinohumite is a gemstone from the area that is quickly growing in popularity in the marketplace here. The locals call it “yellow spinel” for some reason. One particular crystal I saw was 500 grams. The dealer who showed it to me took every precaution against allowing anyone else to see it. 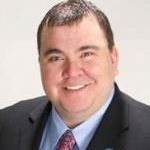 I was ushered into his office, the drapes closed, the doors locked, and then we had to huddle in the back behind his couches close to his safe before he would take it out of the safe. I was amazed to see it, when he put the flashlight under the stone its colored glowed! The specimen is pictured below. 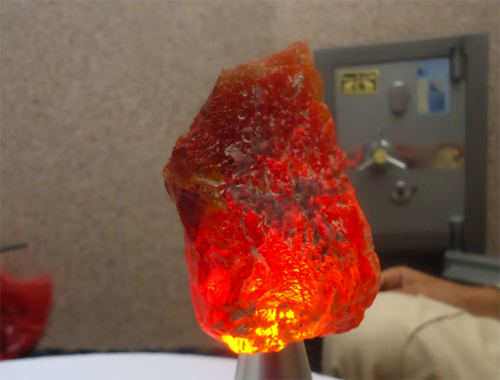 Sphene is a stone growing in popularity in Afghanistan. The stone is hard to find in the rough gemstone form because it is quickly cut and sold. When rough is found, the stones are often heavily included or fractured due once again to the way they are mined. Since I returned to Kabul in November sphene has been very hard to find. The mining season is over and most supply has dried up. Spinel is mined in northern Afghanistan by the Tajikistan border. In all reality though, most spinel in Afghanistan comes from Tajikistan itself. The crystals in this area grow large with crystals up to 50 grams being reported and seen by myself. 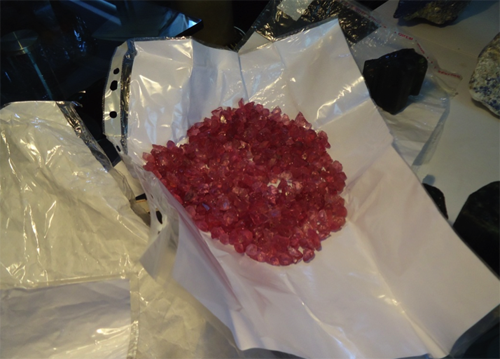 The prices for spinel are also exceedingly high for good quality rough that has good clarity and color. 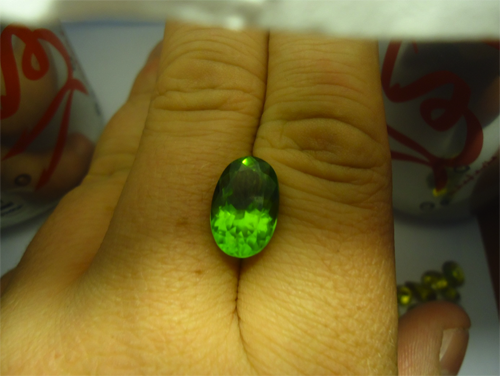 Peridot from Pakistan is sold in Afghanistan. The stones have deeper color than peridot from other regions and usually have good clarity. The stones can come in large sizes, the largest I have seen was just under 50 carats. Afghanistan has many other types of gemstones that were not described in detail by this article. I could write a 100 page article on all of them. Other notable gemstones in the country are: rutilated quartz, citrine, amethyst, morganite, garnet (hessonite,pyrope, and rhodalite), topaz(white, imperial, and coated), ametrine, agates, onyx, carnelian, blue opals, zircon, and fluorite. Let’s not forget Afghanite as well. Most dealers here do not know of the stone. New stones are being discovered all the time, and I think its only a matter of time until the country finds its first large diamond deposit. Part two of this series will cover traditional and new jewelry designs that are being made in Afghanistan.